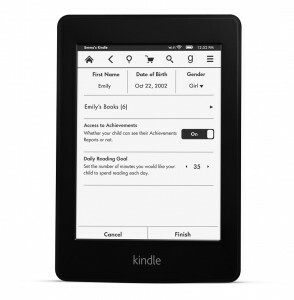 This is Amazon’s sixth generation of Kindle and the second iteration of the Paperwhite (AKA Kindle Paperwhite 2013). It is identical to the previous Paperwhite with the only discerning difference being the the logo on the back which has changed from ‘Kindle’ to Amazon’. It features the same matt, soft finish, rounded edges and is narrow enough to grip in one hand. Like most of the modern eReaders today it has done away with any buttons such as the page turn buttons and just has the one button button – the Power one which sits on the bottom of the device along with the USB Micro port of charging and connecting to a PC or Laptop and an LED charging light. Measuring the same 6.7″ x 4.6″ x 0.36″, it comes in slightly lighter at 7.3 oz compared to the previous 7.5 oz. 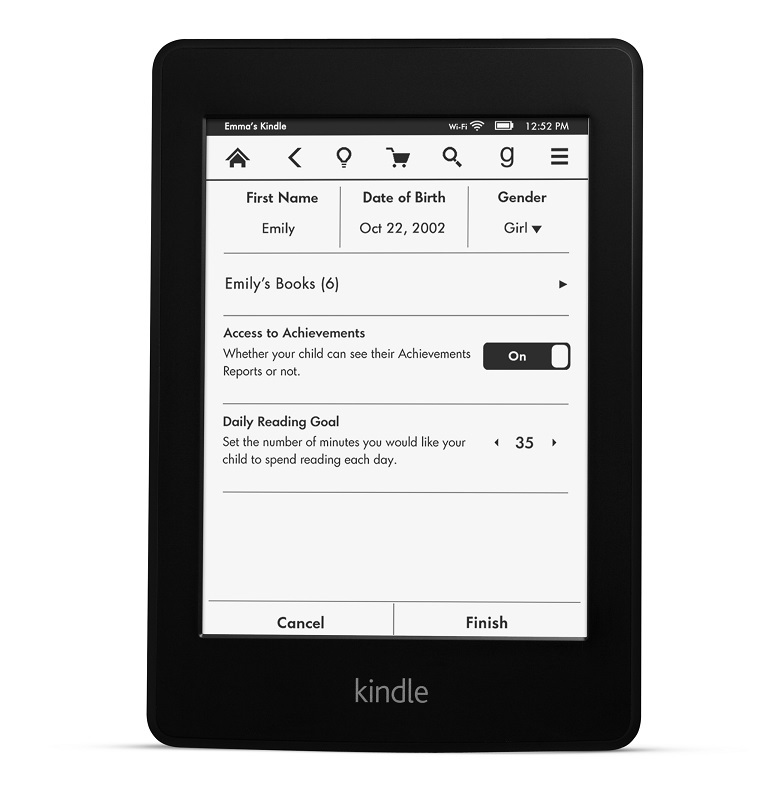 The Kindle Paperwhite 2 features a 6″ eInk display with a resolution of 1024 x 768 and 212 dpi which is the same as the previous model. However it is using the new Carta e-paper technology giving a better contrast than the previous model leading to blacker blacks, whiter background and clearer text. The touchscreen is also more responsive. The built in light has also received a small upgrade leading to an even whiter light and a more even spread of light. A new software feature called “Max” allows you to instantly bring the brightness level to the maximum. The Paperwhite is probably one of the fastest ereaders we’ve ever tested. There’s no nonsense when you turn the Paperwhite on, as soon as it’s fully booted up (a matter of seconds) you’re presented with your homescreen and you can dive straight into your book. The main user interface is exactly the same as the first Kindle Paperwhite with everything clearly laid out on the homescreen. Anything important can be quickly done from here for example accessing the Kindle Store, opening the Kindle store, changing the light intensity or searching for books. It has been specifically designed to launch you straight into either reading or buying books – which is what most people want. Navigating around the menu system is really fast and they seem to have minimized the screen flash when loading new pages. You are able to either view what’s on your device or what’s on the cloud. 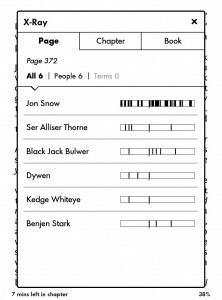 The on-device content is displayed across the top in a series of book covers, and you can find them categorised under the ‘my items’ drop down. You are also able to access your other documents. Interestingly you can easily access your documents (DOCs, PDFs, JPEGS etc.) from the my items drop down too. Along the bottom of the home screen, taking up half of the entire screen, are purchase recommendations. Adverts are essentially taking up half of the screen (on Special Offers model). Similar to the Kobo Aura series’ ‘Beyond the Book’ app, Kindle has an ‘X-Ray’ feature that gives you background information on characters in the book and the author. 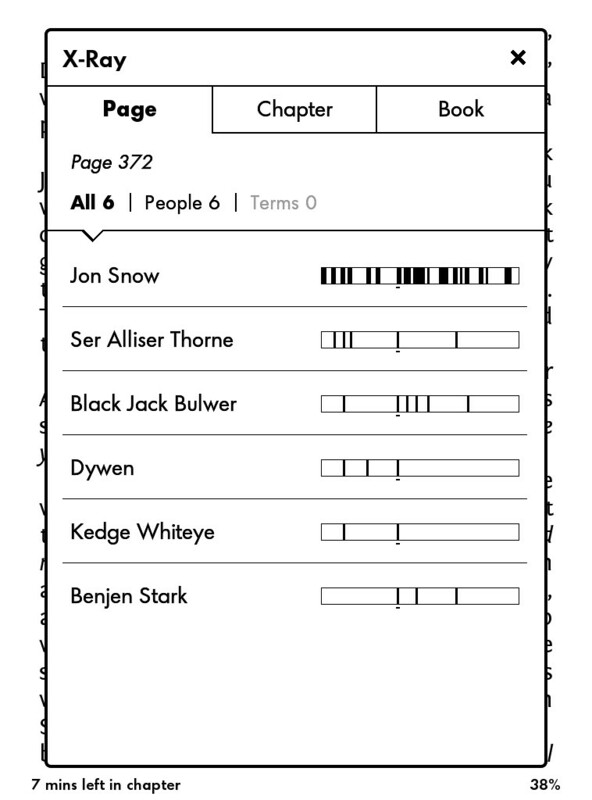 This feature gives you a listing of all the people, places and things in a book. It will reference how often they are mentioned in the book and by who. If you are unfamiliar with certain terms, you can easily look them up. All books you purchase from Amazon come with the X-Ray feature, but now with Smart Lookup it also integrates entries from The New Oxford American Dictionary with information from Wikipedia so you can access definitions, characters, settings and more without leaving your page or losing your place. This feature is though unavailable with books you download from the internet and are only applicable to books bought directly from Amazon. When reading a book you have a number of enhancement options to change the font, size of the text, margins and line spacing. With a single tap or by highlighting a section you can read the complete text of each footnote without changing your page or losing your place in the book or instantly translate into other languages, including Spanish, Japanese, and more. Translations are by Bing Translator. You can also see at a glance how long it will take to finish a chapter or book and with ‘Time to Read’ which personalizes your reading habits based on your reading speed and is constantly updated as your speed and habits change. Whispersync technology synchronizes your last page location, bookmarks, and annotations across all your devices so you can pick up exactly where you left off reading. When you are reading newspapers there is actually a fairly cool feature to save them as clips. You can then turn your various clippings into an eBook, which makes organization a little bit more relevant. What impressed me, was the ability to do this all with PDF files. Normally PDF files are somewhat limited in what you can do with them on the vast majority of e-readers, but Kindle really makes the entire augmentation process easy. One of the best aspects of the Kindle Paperwhite 2 is the overall PDF experience. As I mentioned, you can translate and take notes right on them. You can also double tap to enter a special reflow mode, which smartphone and tablet owners will find fairly intuitive. The pinching and zooming functionality is also fairly robust, but not as solid as with the Sony PRS-T3. One of the drawbacks is the absence of the preview pane when navigating a PDF while being zoomed. This is something that both Kobo and Sony have always done very well, and helps orient you on where you are at on the page. There are also several new features. The first is GoodReads integration, that will allow users to participate in the digital reading community, rate and review books and talk with their favorite authors. The second is Kindle Freetime which provides a valuable tool for parents to limit how long their kids can use the device and configure properties on what they can access, and that they can’t. One of the big new features is called Vocabulary builder. Any singular word you highlight will be placed in this folder accessed from the settings menu. Each word when you click on it will give you the dictionary definition and usage. The usage aspect is very interesting because instead of using the standard thesaurus, it will use the usage from the book you are reading. If you have a bunch of Vocabulary words, you can make Flashcards out of them, and have a virtual slideshow of all your words. This is useful for academic textbooks, bookclubs and a myriad of other practical uses. Kindle Matchbook is another new feature for thousands of qualifying books which means your past, present, and future print-edition purchases will soon allow you to buy the Kindle edition for $2.99, $1.99, $0.99, or free. Amazon now has around 2.1 million titles available in almost 16 different languages. You can access fan-fiction from Kindle Worlds, or read a brief Kindle Single. There are also plenty of newspapers, magazines and graphic novels to download too. Amazon is clearly banking on the fact that you can house your content on the cloud and as your collection grows you can use Cloud Collections to arrange titles in custom categories and see your collections on your other Kindle devices and reading apps. Your cloud is accessed through the homepage and you can upload or download content at all. A good use of the cloud is the fact that purchases remain there and can be added or removed from the device at will. You will always be able to see what’s on the cloud (book covers are held on the device) so you should be able to better manage your on-device collection without getting caught short. Everything can be purchased from the Kindle store, which Amazon estimates hosts 1.5 million titles – two million fewer than Kobo. Downloads are quick, around five to 10 seconds depending on the size of the book, and appear immediately on the homepage. Outside of the recommended books on your homescreen, the store gives you access to more tailored content. Along the bottom of the store are the editor’s picks and the ‘books to try’ section based on previous purchases. You can send a PDF and other documents to your kindle via an Amazon-issued email address and it will sync up and download to your device – provided it’s connected to the internet. A useful and time saving feature if you want to quickly load content to your device remotely. You can also share your thoughts on the book you’re reading on social media sites, which is basically posting a status update from the Kindle – hardly ground breaking but probably a feature that has to be included. The Paperwhite’s internet browser which is titled the ‘experimental browser’, is what you would expect from an eReader. It benefits from the Paperwhite’s speed (the processor has been bumped up from 800 MHz to 1 GHz) and responsive screen, but it falls down with multimedia rich sites . Even basic browsing can a bit of a chore as doesn’t seem to be any forward or back buttons with some pagestaking a long time to load. Not a complete disaster, you can still visit some websites, they just don’t look very good. That being said most people don’t buy eReaders for browsing. Battery life is the same as the previous model coming in at 2 months based on 30 minutes of reading per day and with the wireless turned off. It has 2 GB of internal memory with approximately 1.25 GB available for user content which holds around 1,400 books which should be enough for most readers. It doesn’t come with a MicroSd card for expended memory, but as mentioned earlier Amazon is pushing it’s Cloud Technology to the forefront so user’s are able to store everything online and retrieve it when necessary. The Paperwhite as well as offering a Wi-Fi model, also offers a 3G model. This is particular useful when there isn’t a Wi-Fi hotspot available and means you are virtually always connected. With the 3G model there are no monthly or annual contracts and the service works in over 100 countries. There are actually 4 price points for the Kindle Paperwhite 2. The WiFi only model which retails at $119 for the one with Special Offers or advertisements to you and mean or $139 for the ad free version. The 3G model which includes free access anywhere is $189 and $209 for the ad and ad free versions. Although you do obviously pay a premium for the 3G model if always on connection is that important to you it may be worth the extra money. The Kindle Paperwhite 2 is more an evolution than a revolution, but then the original Paperwhite was one of best eReaders around. This time the Paperwhite’s new Carta screen gives it a slight improvement over the previous model with better contrast and crisper text, the built-in light was even whiter and brighter and finally there is a slight speed increase with the new 1 Ghz processor. So how does the new Paperwhite compare to it’s rivals. I have to say very well. With the exception of the more expensive Kobo Aura HD with it’s slightly larger screen and better resolution which is currently my top eReader, I’d happily put this eReader down as a worthy runner up. While I wouldn’t necessarily recommend getting one if you have the previous Paperwhite for anyone else it comes highly recommended.